A Cornish town has played out the annual hurling of the silver ball. 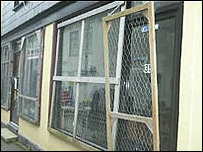 Shops in the town were boarded up in St Columb in preparation for the annual Shrove Tuesday event, which dates back hundreds of years. Hurling is thought to derive from handball matches and was once played all over Cornwall. But now only St Ives and St Columb continue the tradition. The game begins after the traditional words are shouted to the crowd "Town and country do your best. But in this parish I must rest". 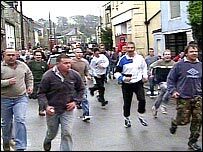 Teams battle for possession of the silver coated ball which is thrown or passed throughout the streets and surrounding countryside. The aim is to get the ball to either the town or country goals set some two miles apart or over the parish boundary. The hurling ball, which is the size of an orange, is made locally from applewood and coated with silver. Hundreds of people watched the spectacle. During the evening the winner toured the pubs, consecrating jugs of beer by dipping the silver ball in them.